An argument that qualitative representations?symbolic representations that carve continuous phenomena into meaningful units?are central to human cognition. 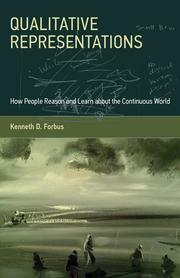 In this book, Kenneth Forbus proposes that qualitative representations hold the key to one of the deepest mysteries of cognitive science: how we reason and learn about the continuous phenomena surrounding us. Forbus argues that qualitative representations?symbolic representations that carve continuous phenomena into meaningful units?are central to human cognition. Qualitative representations provide a basis for commonsense reasoning, because they enable practical reasoning with very little data; this makes qualitative representations a useful component of natural language semantics. Qualitative representations also provide a foundation for expert reasoning in science and engineering by making explicit the broad categories of things that might happen and enabling causal models that help guide the application of more quantitative knowledge as needed. Qualitative representations are important for creating more human-like artificial intelligence systems with capabilities for spatial reasoning, vision, question answering, and understanding natural language.